Yesterday, Rob M0VFC, Steve M1ACB and I left the rest of the group in the shack while we took a trip to the Russian settlement of Barentsberg here on Svalbard. The excursion was organised by Svalbard Travel and is moderately expensive, but well worth the cost for a long day on a boat with an excellent guide. 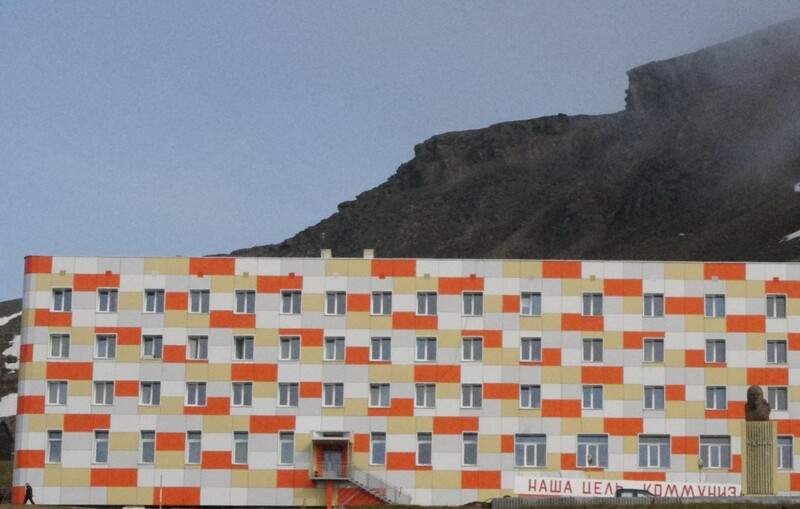 The only disappointment was the fog that plagued us most of the way to Barentsberg. 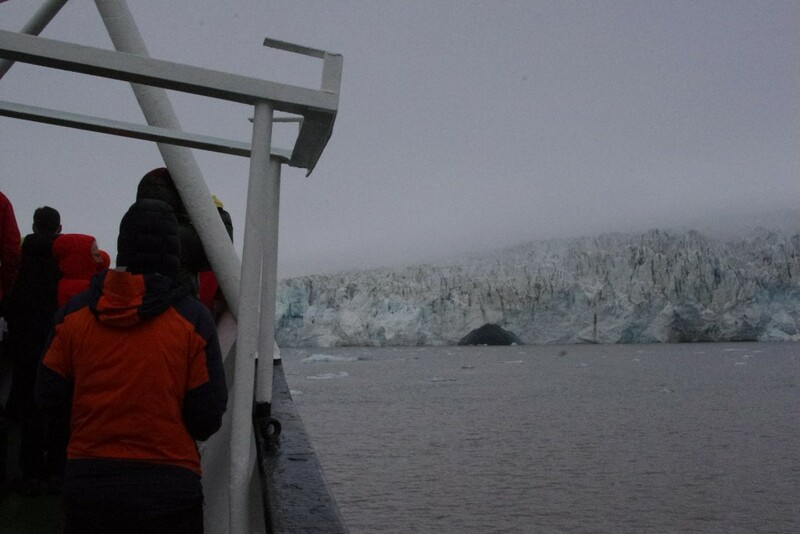 The trip starts with a detour to the Esmark glacier, where we were given barbecued whale on the deck for lunch. I’m not insensitive to the controversy surrounding eating whale but when in Rome… I’d never had it before, and it’s unlikely I will have it again as the meat was rather tasteless other than the chilli marinade it had been kept in. After this spectacular detour (where we even got to see some of the ice breaking off), the ship turned South across the fjord to Barentsberg, where — after a minor issue in which our boat got entangled in another boat’s mooring lines — our guide handed over to a Russian guide for the tour of the town. 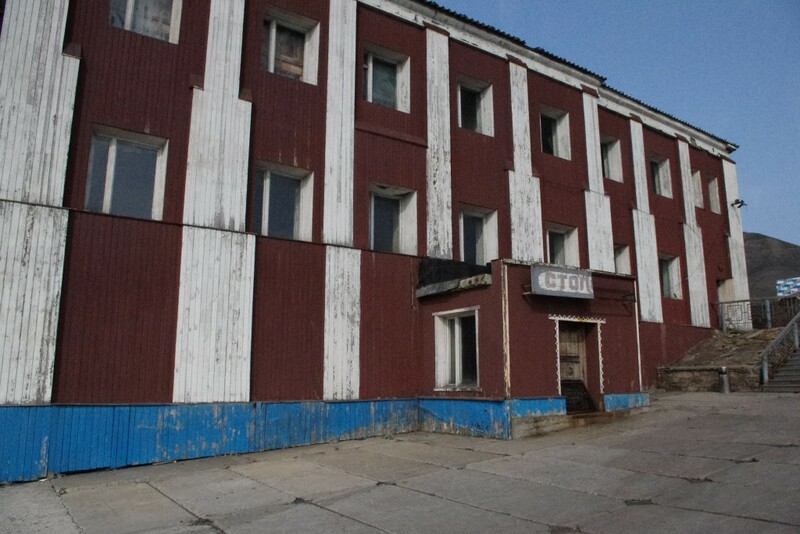 Like most places on Svalbard, Barentsberg was established as a coal mining town and was Russian-controlled for almost all of the 20th century (and it still is). There’s something distinctly not quite right about the place, however. Most of the town has seen better days. The buildings are rotting and collapsing and little effort is being made to preserve them as nature takes over. A broken child’s swing gave me echoes of the photos you see of Pripyat near Chernobyl. In the main square, the guide was keen to point out the statue of Lenin and the sign proclaiming ‘Our goal: Communism’, saying that of course their goal no longer is Communism and that the banner today only reflects an important part in Russia’s recent history. She then went on to explain how the workers are provided housing in large accommodation blocks, there’s a subsidized canteen, and only two shops in the town – one for food and the other for everything else. They operate a cashless society, with credit being stored on cards with which everyone is issued. Contracts for the mining workers are for a fixed 2 years, after which they are allowed to go home for 2 months. I’ll leave the reader to consider the implications of the preceding sentences, but suffice it to say, the place felt like a timewarp. 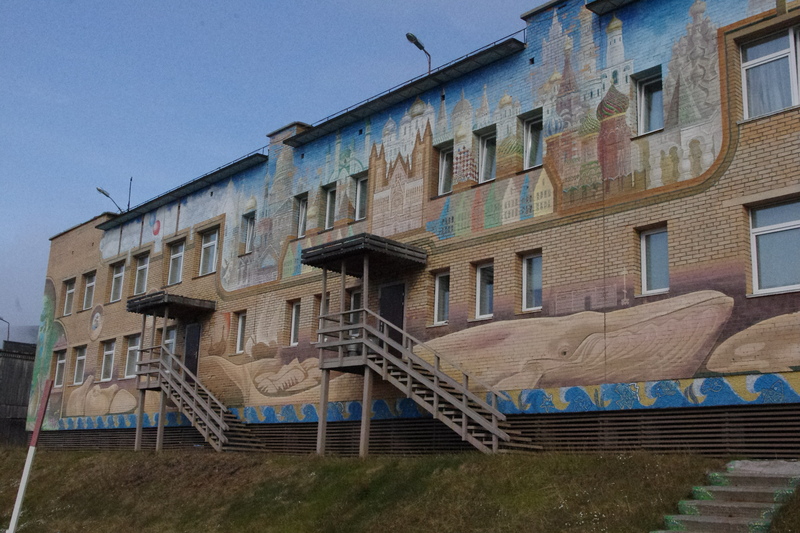 We were also told about the Russian consulate in Barentsberg being the most northerly in the world, with the great acclaim from our guide ‘It’s Russian, and it’s here’. Perhaps the strangest thing about the town, however, is the size of some of the facilities. The current population is just 400 and yet the school (for 40 pupils) and newly-built hospital are clearly designed for many, many more than just the current number of miners and their families. The school for 40 pupils. The artwork was done a few years ago by students at the St Petersberg School of Arts. Our tour’s route from Longyearbyen to Esford to Barentsberg and back to Longyearbyen. 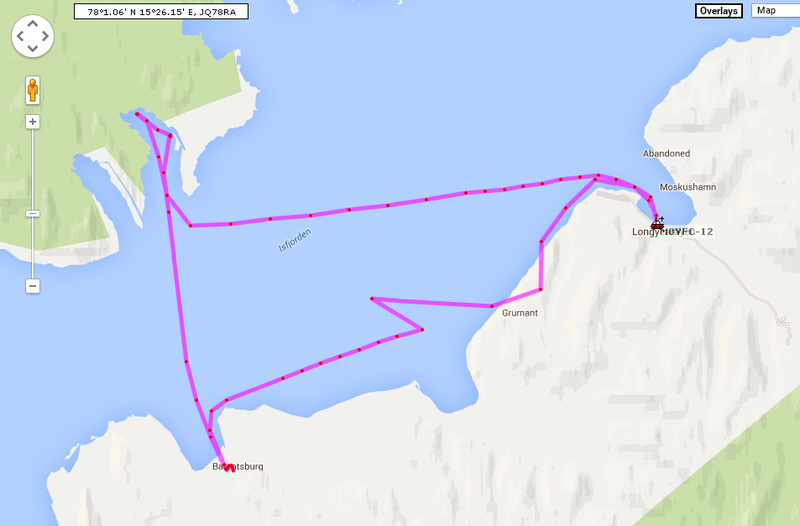 The position that suggests we were on land near Grumant is incorrect – it’s the map that’s wrong not the position!